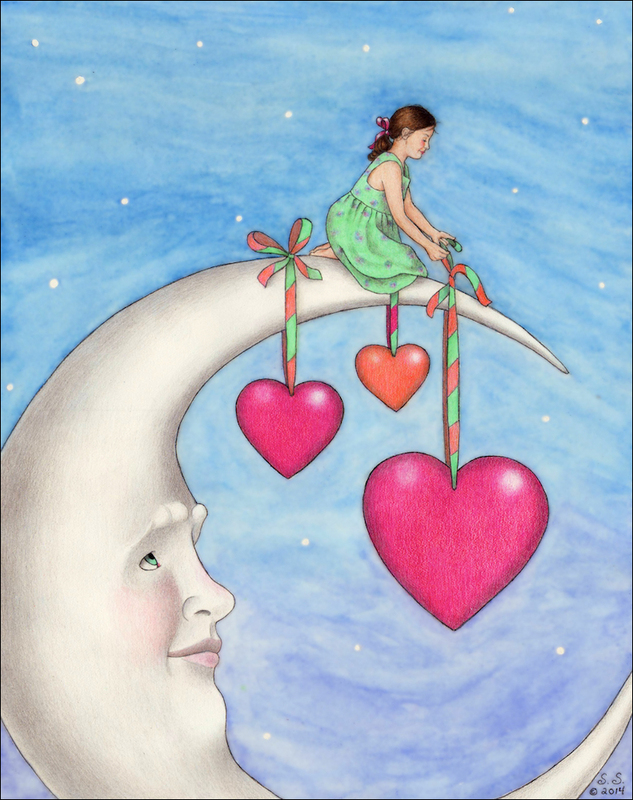 I Heart the Moon 12014 © Sue Shanahan. All rights reserved. Perfectionism is the enemy in art – and just about everything. Over the last 10 years, I’ve developed a pattern of procrastination when I begin a new illustration. I circle over my Arche’s hot-pressed watercolor paper like a hawk stuck on repeat. I think about it, plan out my method of approach, resolve to zero in on it and then am interrupted. It’s always something that is a faux “can’t wait” situation. What is this? I’m an artist. Isn’t painting supposed to be my passion? Why am I so easily pulled off course? Next, I berate myself for becoming distracted and vow to start my image first thing…tomorrow. After about two weeks of this push and pull, I finally force myself to begin. I sit down, grip the pencil tightly and have my eyes inches from the paper to begin the preliminary drawing. It must be perfect. I must be perfect. No wonder I have trouble getting started. I’ve discovered that in pursuing flawlessness I was perfecting the joy and life right out of my art. The more I’ve evolved as a person, the more I’ve embraced my humanity and know many of my character defects are simply survival skills gone awry. Unbeknownst to me, the more I accepted myself, the tighter I gripped my paintbrushes. Losing the enjoyment of my craft, made me wonder what would happen if I painted with abandon. Would it bring back the pleasure and make my artwork come alive? I was ready to experiment. The above piece, I Heart the Moon is the result. I had labored over an earlier version of it in 2012. That one took me six weeks to complete. The new interpretation took two weeks, and l loved painting it. I let the watercolor swirl and land where it wanted to. Unrestricted, filling in the details with colored pencil was no longer drudgery but fun. I felt free. Procrastination didn’t mean I was lazy or a failure. It was just signaling to me that my method wasn’t working. 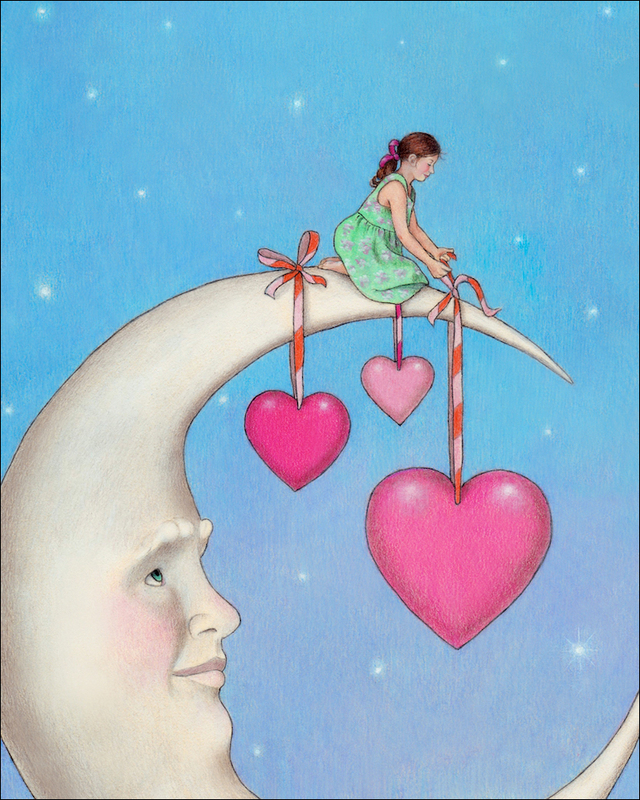 I Heart the Moon 2012 © Sue Shanahan. All rights reserved. Next, I decided to post both pictures on Facebook and take a vote to see which illustration my followers preferred. I was happy to know the new rendering was the favorite, but it wasn’t unanimous like I thought it would be. Some still liked the one that I had done in my “being perfect” stage. Did that mean I was wrong about my up-tightness transferring itself to my art? I don’t think so. What it did confirm is there is an audience for every phase of my work, something I’m particularly grateful for. My art and it’s process are a metaphor for my life. When I pay attention to both, so much is revealed to me. Holding back who I am in any area, not only does a disservice to myself, but to the world too. Dumbing down the “gift of me” is something I learned in childhood. It kept me off the radar of unsafe people. It took years of unraveling before I felt secure enough to risk living uncensored. Letting go, something I resisted, has ended up bringing me great rewards. The truth of who we are is revealed in every spontaneous action we take. And for me, hiding is no longer an option. I know too much. Love this new version, Sue. I foundthe article very interesting since procrastination has been a part of my life for a very long time. Your article inspires me to break the cycle. Thanks! I love the idea of being free to be yourself.